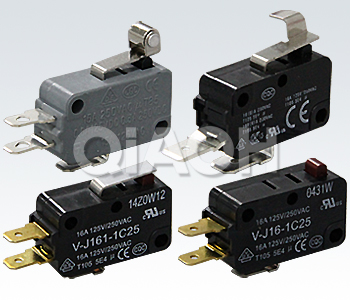 V-J small basic switch - V-J (KW9) microswitch - PRODUCT - Shanghai Qiaoh Industry Co., Ltd.
■The micro switch - high reliability. 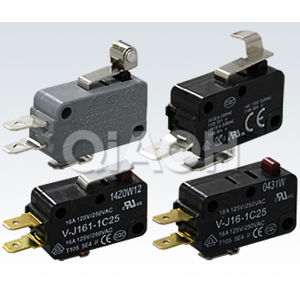 ■Can be widely used in household appliances, office equipment. ■In line with the EU REACH regulations. Action characteristics, model V-J21V-J16V-J15, force recovery force, OF **RF, small 3.92N0.78N1.96N0.49N, pre travel, over travel, poor response, PT **OT, small MD**1.2mm1.0mm0.4mm action position OP14.7 + 0.4mm. Action characteristics, model V-J211V-J161V-J151, force recovery force, OF **RF, small 3.92N0.49N1.96N0.49N, pre travel, over travel, poor response, PT **OT, small MD**1.6mm0.8mm0.6mm action position OP15.2 + 0.5mm. Action characteristics, model V-J212V-J162V-J152, force recovery force, OF **RF, small 2.45N0.25N1.23N0.14N, pre travel, over travel, poor response, PT **OT, small MD**4.0mm1.6mm1.5mm action position OP15.2 + 1.2mm. Action characteristics, model V-J213V-J163V-J153, force recovery force, OF **RF, small 1.27N0.12N0.69N0.06N, pre travel, over travel, poor response, PT **OT, small MD**9.0mm2.0mm2.8mm action position OP15.2++2.6-3.2mm15.2 + 2.6mm. Action characteristics, model V-J214V-J164V-J154, force recovery force, OF **RF, small 2.45N0.25N1.23N0.14N, pre travel, over travel, poor response, PT **OT, small MD**4.0mm1.6mm1.5mm action position OP18.7 + 1.2mm. Action characteristics, model V-J215V-J165V-J155, force recovery force, OF **RF, small 4.71N0.49N2.35N0.49N, pre travel, over travel, poor response, PT **OT, small MD**1.6mm0.8mm0.6mm action position OP20.7 + 0.6mm. Action characteristics, model V-J216V-J166V-J156, force recovery force, OF **RF, small 2.45N0.25N1.23N0.14N, pre travel, over travel, poor response, PT **OT, small MD**4.0mm1.6mm1.5mm action position OP20.7 + 1.2mm.